Because it is located in one of Brisbane's most enviable location the Rydges Hotel Southbank is a very popular place to stay. The property has been recently refurbished and provides travellers with luxury hotel accomodation in the heart of the arts and entertainment precinct of South Bank. The Rydges South Bank adjoins with the Brisbane Convention & Exhibition Centre and is only a short walk to the Queensland Performing Arts Centre, Queensland Museum, State Library of Queensland and the new magnificent Gallery of Modern Art. For value for money hotel accommodation in Brisbane travellers will find that the Rydges Southbank is the ideal choice. This affordable hotel features a variety of rooms that are designed for both business and leisure travellers as well as great amenities like lounge bar, business centre, conference centre, guest laundry, fitness equipment, lift, restaurant, room service, sauna, spa, tour desk, 24 hour reception and daily housekeeping. 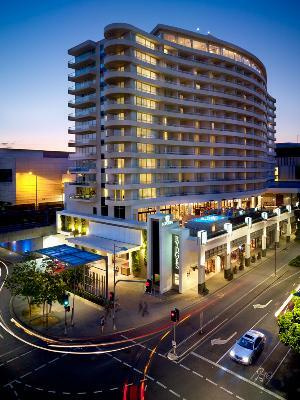 Whilst staying at the Rydges Southbank Hotel guests can enjoy the delights at the Parklands Bar and Grill Restaurant, the Crown Lager Bar for an intimate cocktail or the live jazz entertainment on Saturday nights. Deluxe Twin Room : Sleeps up to 4 guests on 2 Double Beds. King Suite : Sleeps up to 4 guests on 1 King Bed + Sofa Bed. Queen/ Twin Room : Sleeps up to 2 guests on 1 Queen Bed. Superior Queen Room : Sleeps up to 2 guests on 1 Queen Bed.